They swirled, stomped and drummed. Flamenco. Pan African. Tahitian. Nearly a dozen acts representing as many countries and cultures took to the stage at the recent San Francisco Ethnic Dance Festival. The costumes were magnificent, the performances exquisite and the audience filled with joy as a lineup of artists pumped energy, beauty and learning into an afternoon of dance celebrating the event’s 40th anniversary. It was thrilling to see Eskimo singers and dancers, a Chinese Lion and indigenous Bolivian and classical Indian performers all sharing their unique art forms and then joining together in a rousing finale onstage, up the center aisle, into a lobby jam and out onto the streets of the city. For me, it was a great reminder of the power of the arts to bring diverse people together in shared experiences that transcend boundaries, open minds and captivate the imagination. The arts scene is happening all around us throughout the year. Experiences are out there, waiting to be discovered. I encourage you to explore your local arts community and get involved. 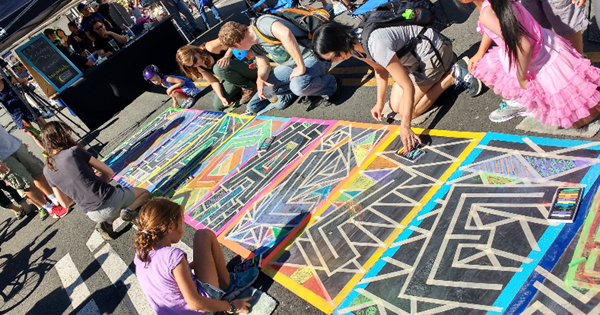 On my schedule for the next few weeks in Silicon Valley are the San Jose Jazz Summer Fest, the Luna Park Chalk Art Festival and the Free Shakespeare in the Park—all supported by Applied Materials, demonstrating the company's belief that vibrant, creative communities fuel innovation and improve neighborhoods. I hope to see you there!